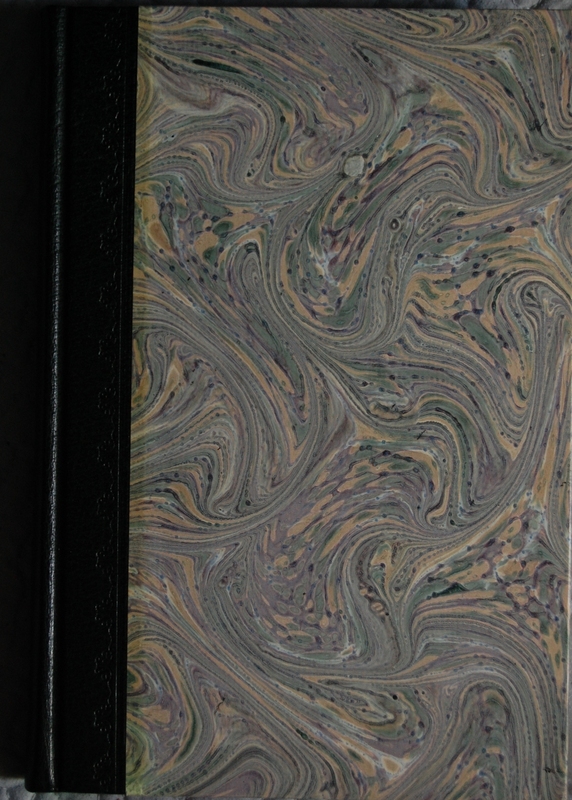 Front Binding – Before beginning, I’m experimenting a little with format options on this post. I’m hoping it’ll make the posts look a little more snazzy. Welcome back, dear friends! 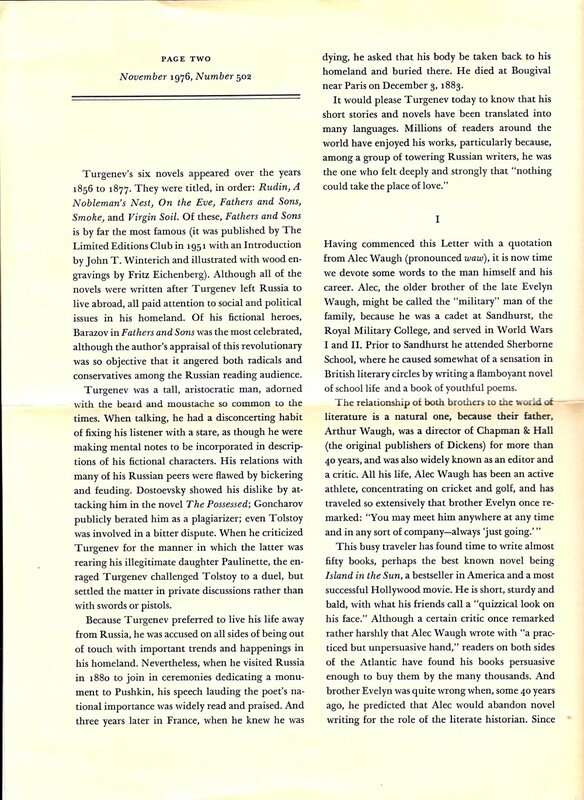 I’m out of school for a month or so, so I’ll be working to get some new content onto the blog, including this, my latest LEC, Ivan Turgenev’s The Torrents of Spring. This is the second Cardevon Press LEC I’ve shared, with Three Men in a Boat preceding it. 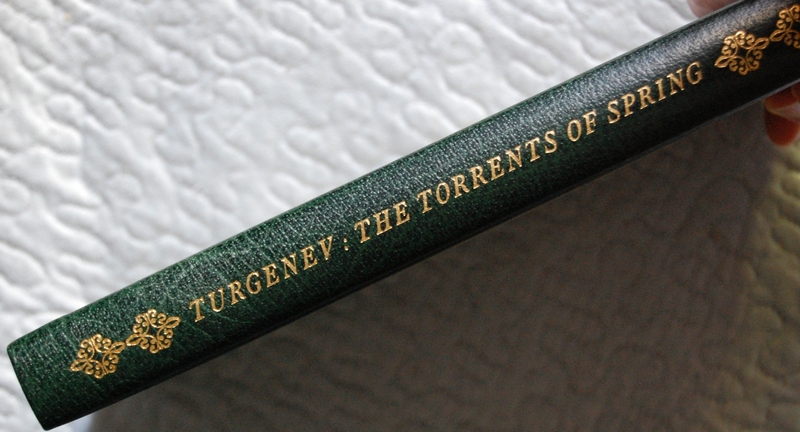 Turgenev is one of the Russian masters, perhaps a little buried in the shadow of his fellows Dostoevsky, Tolstoy, Pushkin and Chekhov, but a master he is! 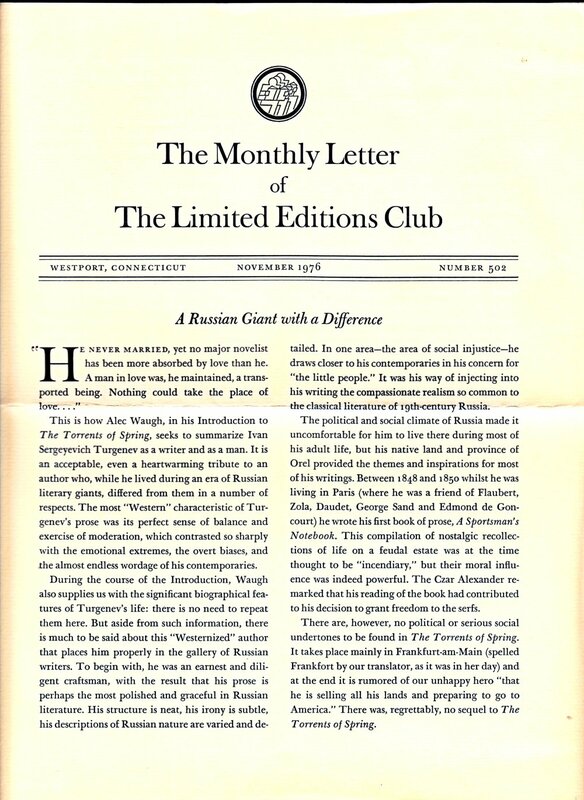 The Limited Editions Club visited his work twice in their lifeline, first giving his greatest work Fathers and Sons an Eichenberg treatment in 1951, and then this particular release in 1976. 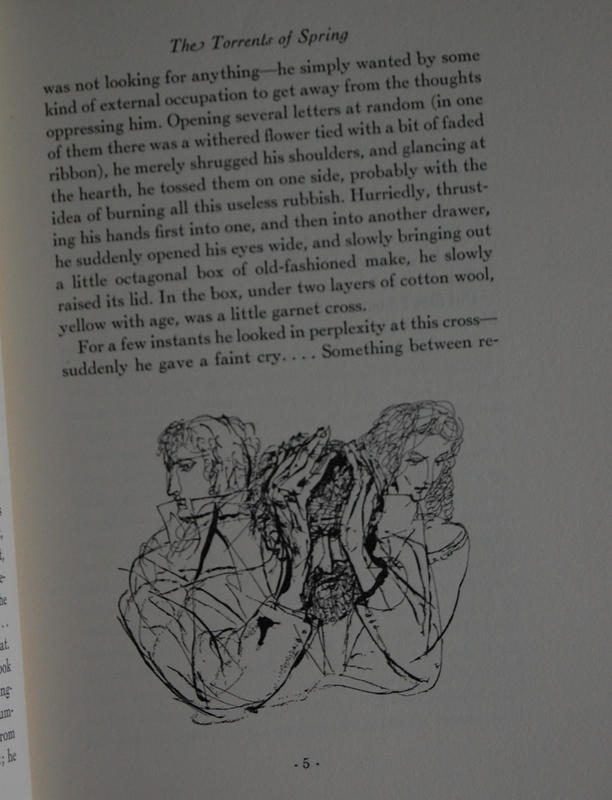 Lajos Szalay has appeared here before, illustrating Chekhov’s Two Plays, issued in 1966. I wasn’t too keen on his work in that edition, but this! 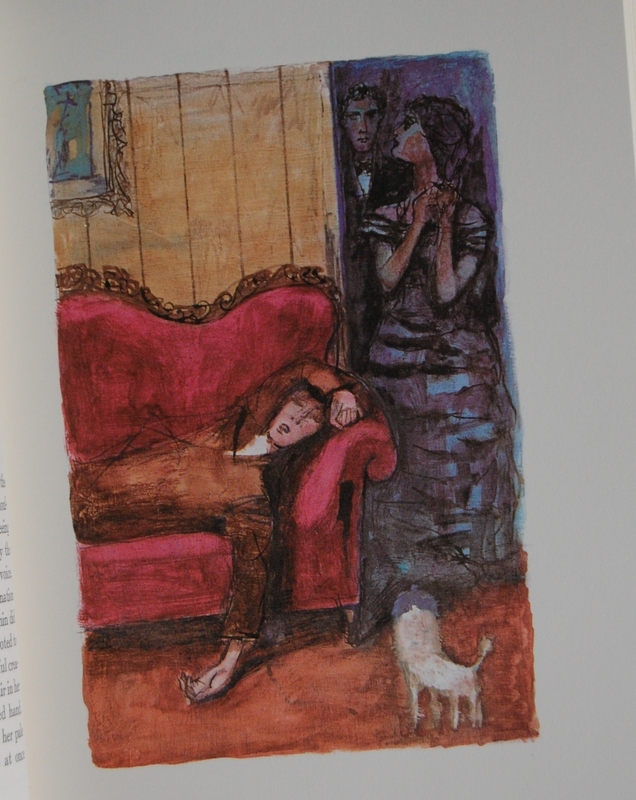 There are some exquisite full color illustrations in this book that wowed me. I suppose his linework isn’t too my taste, but I no longer consider him to be among the least impressive artists I’ve come across. Beyond those two works, he also stepped in to render a second Chekhov LEC, a collection of his short works of fiction issued in 1973. Production details are in the announcement letter below in the Monthly Letter gallery. 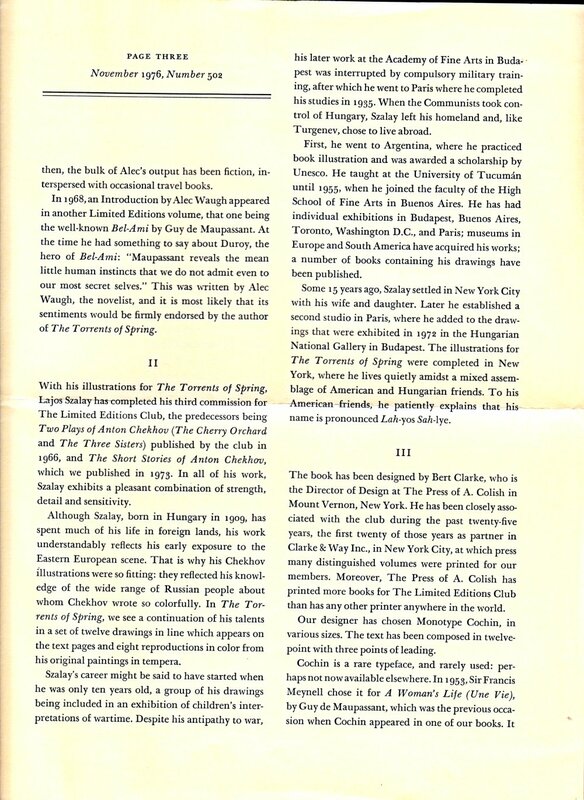 Title Page – Alec Waugh is the introduction provider; I swear I’ve stumbled upon that name elsewhere in my collection. Constance Garnett, the usual source of Russian translation for the Club, has once more been selected. 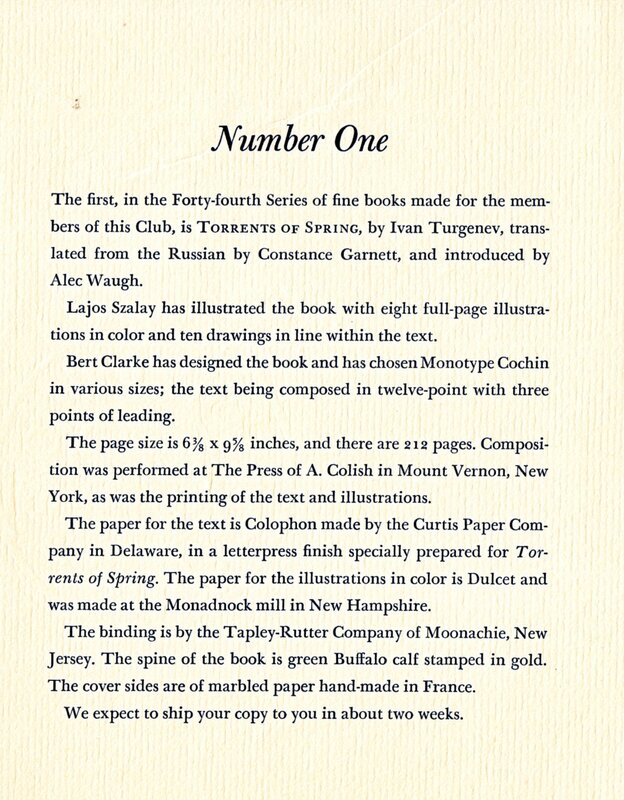 Colophon – AKA Signature Page. 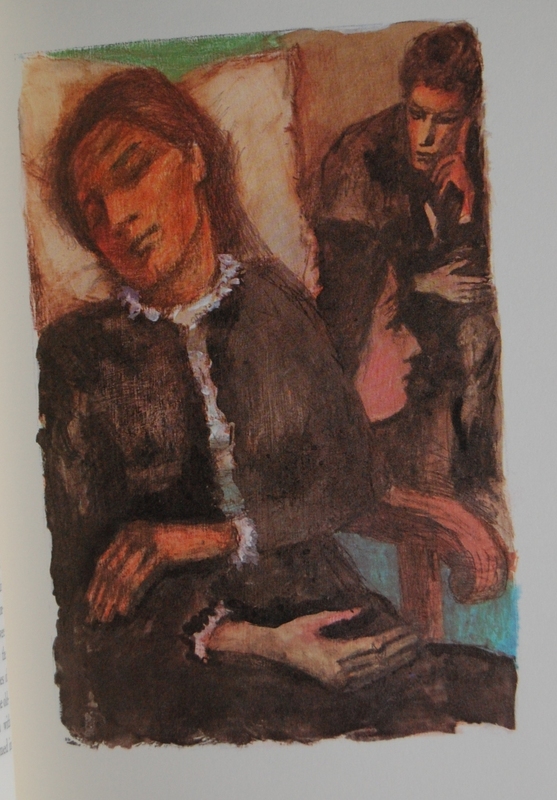 This copy is #397 out of 2000, and Szalay offered his signature to posterity. 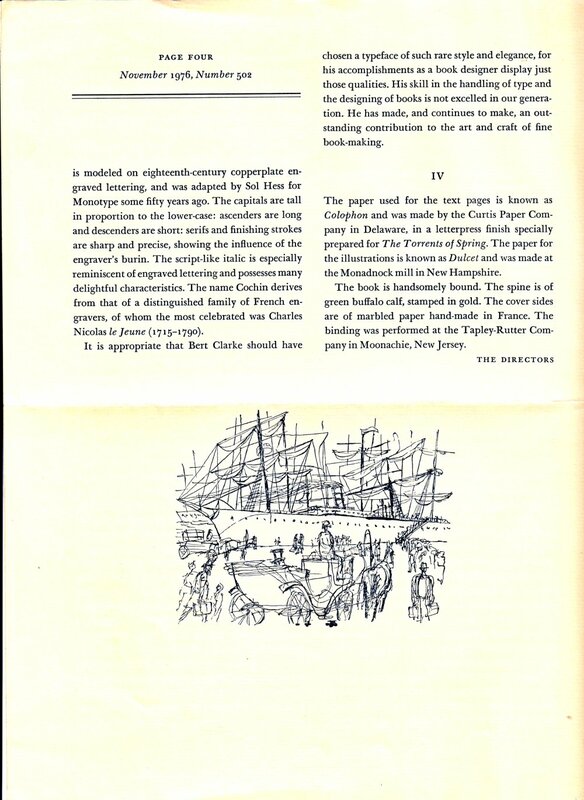 Page 5 – An example of Szalay’s linework. Page 8 – Szalay’s linework alone hasn’t done much for me, but his full-color artwork is splendid! 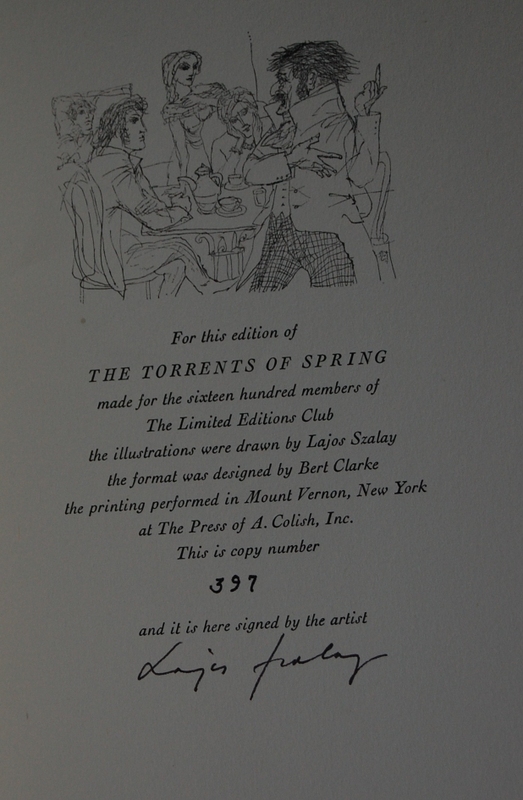 Just pulled out my copy of the LEC Torrents of Spring. I’ve read so many Russians that I sometimes get them connfused. Turgenev is always a pleasure to read, but I think Fathers and Sons is a better book. On the plus side, the spine is covered in a Buffalo calfskin which should hold up better than the abominable sheepskin which was used on so many LECs. The boards are supposedly covered in hand-marbled French paper. But how could you tell? The paper is covered in some kind of coating which takes away all semblance of a hand-marbled paper. The coating is thick and translucent and the book might as well have been covered in butcher’s paper instead of a hand-marbled paper. I bought my copy through my Club membrship so I never saw the book until it was published. If you are collecting LECs and have many more to go, you might want to skip this one. Covering what looks like a decent paper with this horrible translucent plastic makes one happy that producing this one didn’t occur on Macy’s shift. 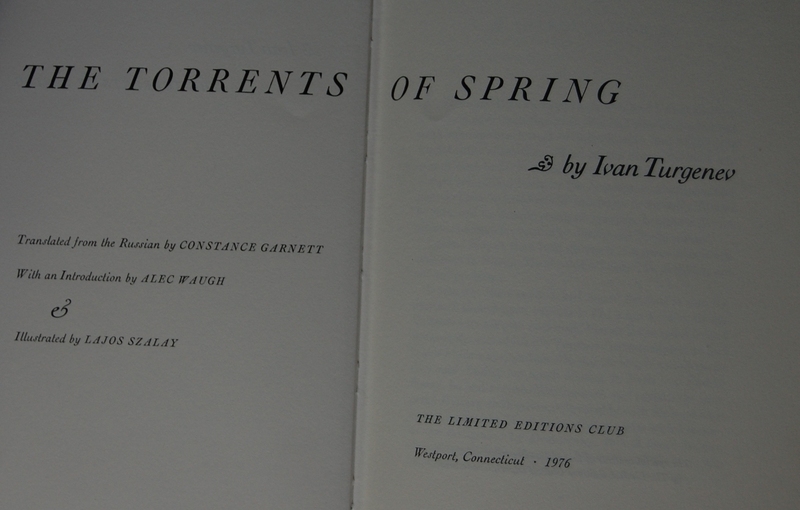 You are currently reading Limited Editions Club – The Torrents of Spring by Ivan Turgenev (1976) at The George Macy Imagery.